Brimming with cinnamon, ginger, cardamom and cloves, a cup of aromatic Bengal Spice tea is like a trip to an exotic spice market in a faraway land. This adventurous blend is a caffeine free interpretation of Chai, a piquant Indian brew traditionally made with black tea. 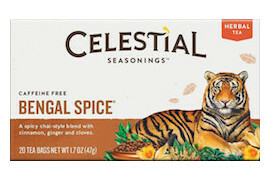 Try Bengal Spice with milk and sugar for a true Chai experience. Ingredients: Cinnamon, roasted chicory root, roasted carob, natural spice and vanilla flavors with other natural flavors, dates, ginger root, cardamom, black pepper, cloves and nutmeg.